“Who can wear this kind of cowboy boots?” my husband asked me, referring to a multi colored cowboy boots a girl was wearing. “If you knew me when I was in high school, I would have probably wore this kind of boots along with my mother’s old jumper dress”, I replied. My fondness for such eccentric clothes didn’t mean that I was outdated or had bad taste, I hope not; but because I have never been the kind of person who wears the latest fashions. My style went from masculine in middle school to heels and skirts in high school and Jean’s and blouse collection in college. My mother would ask me every time she saw me with a new trend: “What is your style already?” “My style is original and unique mommy”. I would answer her proudly. If the trend this season were to wear skinny Jean’s I would wear dresses. If it were in to wear candy pink I would wear pale pink. A rebel? Maybe! So when it comes to food, you would imagine that I don’t give in to a trend easily. I would wait and wait until I know everything about this newly embraced way of eating. I tell myself that I would never try it if I don’t fell in love with it. “I am original and unique”. Remember? It would ruin my reputation of rebel in front of my entourage. So it took me some time before I decided to try on the Current trend in Paris: Les Verrines and went for a Black Forest Verrine. Black Forest gateau is a southern German dessert (Schwarzwalder Kirschtorte), it is typically a chocolate cake, layered with whipped cream, cherries and decorated with additional whipped cream and cherries and chocolate shavings. Traditionally, Kirshwasser is added to the cake, but having some great results the last time I used orange blossom water with cherries I decided to use it again. 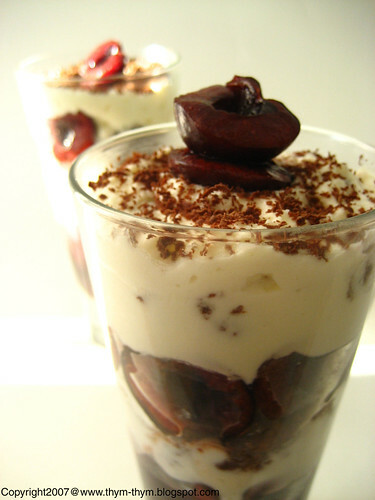 The idea of converting Black Forest gateau into a verrine came to me because I wanted to make individual desserts just for my hubby and I. Since I don’t have individual cake molds I thought that Black Forest being a layered cake, it would work wonderfully with the concept of verrines. That way we can have our dessert and keep the chocolate cake left for our afternoon’s snacks. My cherries being sweet I didn’t want to add too much sugar to the heavy cream nor the compote. 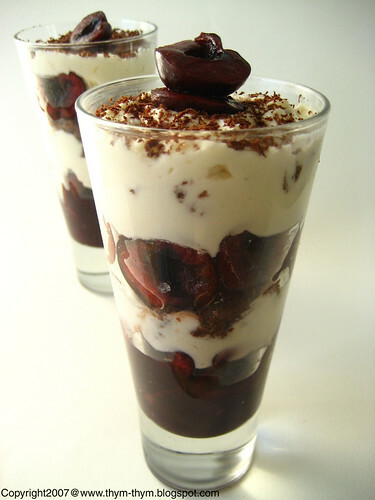 Depending on the sweetness of the cherries you can either add or reduce the amount of sugar to suit your taste. Having a layered cake in a glass is a fun and mess-free adventure. Both my hubby and I went sighing and smacking our lips every time we brought our tall spoon to our mouth, with nothing else to say except that being trendy has never felt that good. Sift the cocoa, the flour and the salt. Set aside. Mix the eggs with the sugar and the vanilla until thick and pale. Add the dry ingredients in 3 batches until well incorporated. Add the melted butter and mix just until blended. Put the batter in a greased and floured cake pan and bake in a preheated 375F oven for 25-30 min until a toothpick inserted in the cake comes out clean. Let cool 5 min in the pan then invert into a wire rack to cool completely. For the cream, whip the heavy cream on high speed for 1 min until fluffy then add the sugar and vanilla and continue whipping until soft peaks form. Let cool in the fridge. For the cherry compote: In a saucepan, put the cherries, the sugar, the blossom flour water and cook covered until the cherries start to burst and thicken slightly. Puree the cherry compote and let cool in the fridge. 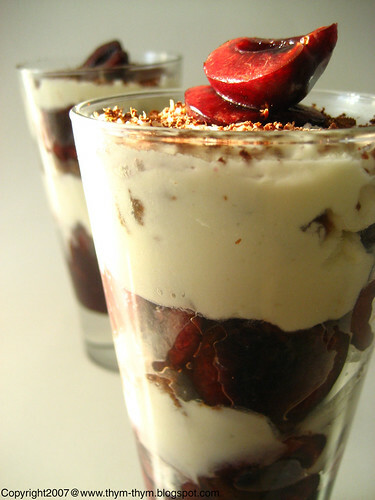 Assemble the Verrine by scooping a layer of the compote into the bottom of the glass, then a layer of crumbled chocolate cake, a layer of fresh cherries, a layer of cream, a layer of chocolate cake, a layer of cherries, a layer of cream and finish by sprinkling some grated chocolate and decorating with fresh cherries. Chill until served. Tamiser la farine, le sel et le cacao et mettre de cote. Dans un bol, melanger les oeufs, le sucre et la vanille jusqu’a ce que le mélange devienne pale et epais. Ajouter les ingredients secs en 3 fois jusqu’a tout soit bien incorpore. Verser dessus le beurre et melanger juste pour bien l’incorporer a la pate. Verser votre pate a gateau dans un moule beurré et farine et mettre a cuire dans un four prechauffe a 180C pendant 25-30 min, jusqu’a ce que la pointe du couteau inserre dans votre gateau en ressort propre. Laisser refroidir dans le moule pendant 5 min puis demouler et laisser refroidir completement dans une grille a patisserie. Pour la crème, a l’aide d’un batteur, batter votre crème liquide pendant 1 min a grande vitesse jusqu’a ce que la crème devienne mousseusse. Arreter le bateur, ajouter le sucre et la vanille puis continuer a batter a grande vitesse jusqu’a ce que la crème devienne ferme et onctueuse. Mettre au frais. Pour la compote de cerises, mettre les cerises, le sucre et l’eau de fleur d’oranger dans une casserole. Mettre sur feu doux. Couvrir et laisser cuire jusqu’a ce que les cerises ramollissent et que la compote devienne legerement epaisse. Passer au mixeur votre compote et mettre au frais. Pour assembler vos verrines, Mettre au fond de chaque verre un peu de compote de cerises, suivi d’une couche de gateau au chocolat émiette, une couche de cerises fraiches et une couche de crème. Recommencer avec une couche de gateau au chocolat, une couche de cerises et une couche de crème. Mettre au frais jusqu’au moment de servir. That looks heavenly. If it's possible to lust for a food photo, I think that's what I felt when I saw that. You should submit this for the monthly food blog awards. I think we would have gotten on very well at school. I was very much like you. As a matter of fact I was the only girl in Qatar who wore red cowboy boots from Texas - with spurs LOL! This is the most awesome dessert. I have a similar recipe and was ogling it the other day. Think it's time to stop ogling and go ahead and make it!! These look so amazing! I love desserts that are individuals. je m'absente 3 jours et deja je rate deux superbes recettes toutes aussi craquantes l'une que l'autre ! J'en profite pour te dire que j'adore tes photos (en général), qui sont un vrai régal pour les yeux ! I never learn not to look at food blogs when I have 2 hrs until dinner. Oh my you kill me with this. I like the cowboy boots story - nothing wrong with that! And what a lovely thing trying to dress in a unique way - usually, teenagers seek the opposite (I'm going through that phase now again, with my 13-year-old sister). The verrines are so sophisticated! I bet they were stunningly delicious! Trendy yet delicious. I think your photos show your style... looks awesome! - Red cowboy boots in Qatar? Now that's something we don't see very often. Thak you very much for your kind words. - C'est tres gentil de ta part lili. - Crois moi Mingoumango, je me suis battu contre cette mode, mais helas a la fin je ne pouvais pas resister. Merci beacuoup pour ton adorable commentaire. Contente que mes photos te plaisent. - It's the same with me, Cheryl. If only I was able to give a verrine from my screen. - You must enjoy very much your sister's new trends Patricia. Don't worry, it will calm down like I did, sort of..not really. Thank you very for your message. - Thank you very much Kristen. Really apreciate it.